Project Assistant Fiona Hall gives an update on some of the potential avenues of research she has found in ‘Home Front Memorial Project and The Belgian Connection’. Hello! I thought I would update on my progress so far, it’s been a few months since my last post regarding the Home Front Memorial Project. However, you may have noticed my blog posts on Bourdon, a figure that I thoroughly enjoyed researching. It’s always a joy to be able to build a picture of someone through archive material. Below is a little snippet of what I have discovered and learnt so far; some of which has been inspired by developments in my own interests relating to the First World War. My main priority at the moment is to transcribe information from the alphabetical student registers onto a database that will be cross referenced with the names on the Roll of Honour. This will allow for those involved in the Home Front related activities to be remembered and honoured in a memorial next year. I have completed the ‘Mcs’ now and hopefully by next week I will have a 1,100 names! Whilst looking through the alphabetical student register I came across Jack Coia’s entry. Pardon my ignorance but I didn’t realise he attended the School during this period! Coia qualified for entry to the Glasgow School of Architecture following evening classes at Whitehill School. Due to poor eyesight, Coia was exempt from military service and in 1917 enrolled in evening classes at the School of Architecture. I am interested to find out if other students were exempt from war duties due to medical conditions. What I have also noticed is that a number of entries have the initial ‘M’ or ‘A’ written beside their surname – I often wonder if these stand for ‘Military’ or ‘Army’ – I will need to do a bit more digging. While working my way through the alphabetical register I came across the name of several Belgian students enrolled at GSA. I cross referenced these with the Belgian Refugees Register collated by Glasgow Life, and it would appear that some Belgian Refugees attended the School of Art while living in Glasgow during the First World War. Francois or ‘Franz’ Brisé (1914), and Leon Van Den Houten (1915) are both listed in the register. I have also discovered (this week) two more names in the register that are not listed on the link above. Once I have completed my work on the registers these Belgian artists and sculptors will be my first port of call – I am really looking forward to researching their lives and careers. Perhaps their experience of life in Glasgow and at GSA influenced their work in some way. Myself and other members of the Archives and Collections team had the pleasure of attending the launch of ‘Lest We Forget’ held as part of Refugee Festival Scotland. Featured in the exhibition were several items from our collection relating to the Belgium Tryst, including a poster for the Tryst featuring the work of artist and illustrator Maurice Grieffenhagen, who taught at the School from 1906-29. The piece by Maurice Greiffenhagen, along with works on display by Frank Brangwyn – courtesy of Glasgow Museums – led me to think about the relationship between art and war, and the impact of the war on art and the artists themselves. The works of those connected to GSA, such as Muirhead Bone and Norah Neilson Gray are examples of artists trying to convey the realities, and often their own experiences of war. Copy of lithograph by Maurice Greiffenhagen, depicting the plight of the Belgians and the Red Cross. Below are two pieces of artwork by Norah Neilson Gray, I would love to know the story of the Belgian in the painting. Perhaps my next task? 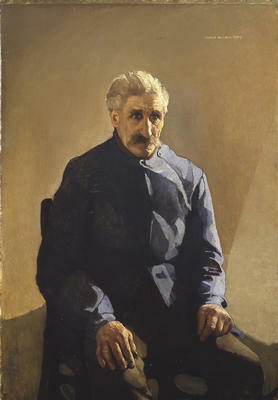 The Belgian in Exile, Norah Neilson Gray, c1915-21. Image courtesy of Art UK; Argyll and Bute Council. Hôpital Auxiliaire d’Armée 301 – Abbaye de Royaumont, Norah Neilson Gray, 1918. Image courtesy of Art UK; Argyll and Bute Council. There were of course Belgian staff members at the School – you can read more about some of the GSA’s Belgian staff in the recent post The Belgian Big Three. Whilst researching this ‘Belgian connection’ I came across several works by Jean Delville, who taught at the school. His work Les Mères depicts Belgian mothers grieving for their fallen sons on the battlefield. Les Mères, Jean Delville, 1919. Image courtesy of Pinterest. I am currently in the process of cataloguing the Belgium Tryst material – namely documents and leaflets related to the fundraising event that took place in January 1915. I will take a more detailed look at the Tryst in my next blog post, so keep an eye out! I am also beginning to recognise several names repeated throughout the documents that also appear in the alphabetical register. Two of these are Grace Wilson Melvin and Anne Knox Arthur; I hope to explore both their roles over the next few weeks. What strikes me is the amount of organisation and effort put in by the groups of students; documents illustrate that they were involved in all aspects of the Tryst’s planning and execution. Glasgow Life, Glasgow Life Belgian Refugees Register, 1914-20.